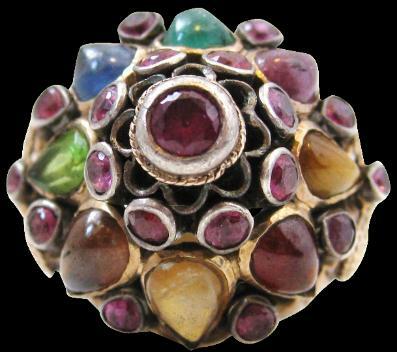 The design of this ring is particular to Bangkok and to Thai royalty. Originally such rings were worn by Thai princesses and aristocrats of whom there was no shortage given the highly polygamous nature of the Thai monarch and other senior male members of the Thai extended royal family. 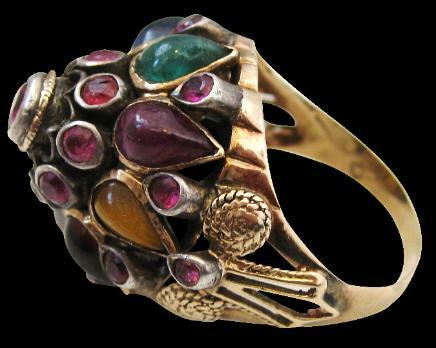 This ring is typical of such rings – a gold band (around 9 carat) and a conical multi-tiered bezel of stones including rubies, peridots, garnets, emeralds, sapphires and zircons. This example includes applied gold rope-twists and silver mounts for the central and second tier of rubies.